10.03.06 After 1.e4 e5 1. Nf3 Nc6 3. 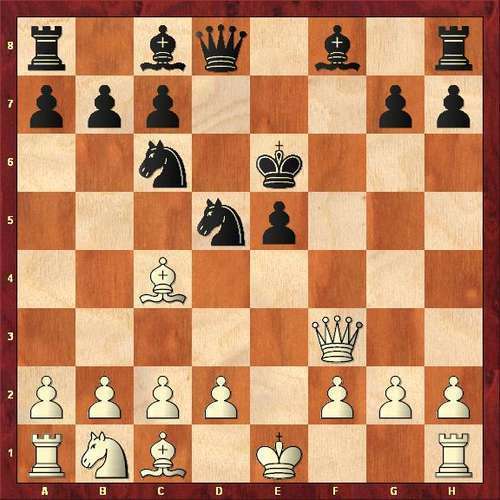 Bc4 Nf6 "Siegbert Tarrasch called 4 Ng5 'ein stumper zug'--a beginner's move. White has developed two pieces and proceeds to crudely attack with them--obviously not correct strategy. But Steinitz believed otherwise and more recent opinion seems to be mixed on this subject." So writes Nick de Firmian in his colossal work Modern Chess Openings: 14th Edition. Come to the George Cunningham Chess Club this week and decide for yourself at the Fried Liver Attack Tournament. At 7:30 this week we will have a tournament featuring the "Fried Liver Attack"
White has traded a knight for a pawn, but black's king is in the center. Which is worth more? was: 1. Ghezai Menelik, 2. Cullen Edes, 3. tie Brian Chick and Sean O'Brien. begins October 18. You could be the next UMaine Chess Champion!